The Quantum Leap meets Captain N story of a gamer literally sucked into videogames. “Crap crap crap crap CRAAAAAAAP,” Tom shouted as the third wave of Tarrasques emerged from the central Zerg hive. “We can’t hold out much longer like this!” Alli cried. “CRAAAAAAP. Rick, what’s the situation up there?” cried Tom. “What? No, we’re doing this together.” Tom could now hear the roar of the enemy forces through Emmi’s comm link. “I am truly sorry, Tom, and I do hope you are successful in this task. It has been a pleasure making your acquaintance.” With that, Emmi’s link went dead. 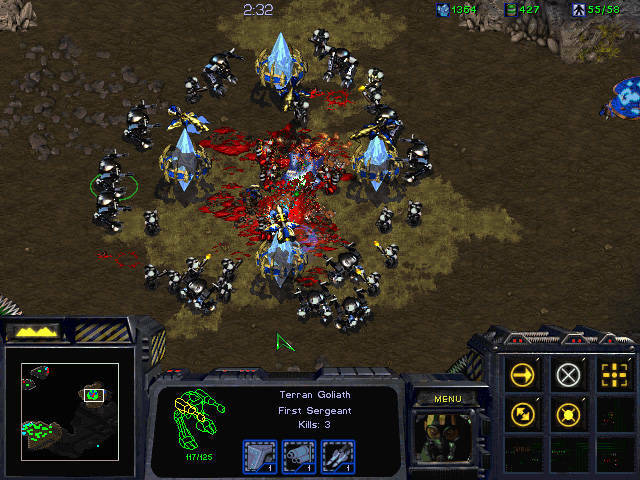 Suddenly, another wave of Zerg hit Tom’s base, but his forces barely felt it. The tanks he had begun to manufacture for Emmi had moved over his front line, and were quickly felling anything that came within range, including the Tarrasques. Tom wasn’t sure if it was concern or morbid curiosity that caused him to send a cloaked unit to check on Emmi’s base, but what he saw surprised him. From his vantage point he could see the Zerg forces eviscerating his ally’s base. Emmi, however, had withdrawn her forces to the base’s edge, and was ready to close in on the invading swarm and crush them from behind. The resulting fight was bloody, but evenly matched. Tom watched helplessly as the two sides collided. By the time it was over, everyone in the area had been annihilated, leaving behind nothing but scorched earth. Tom brought his unit back to base, and spoke into his comm. “But, there has to be another way!” Rick protested. “Oh my GOD, could you two PLEASE finish up your Lifetime movie and give me some freakin’ backup? !” interrupted Alli.